Note: The follwing instructions valid when you loginto your mail via thunderbird. 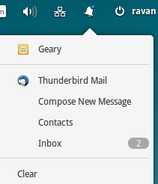 Also this is the normal(default) behavior for thunderbird (also for geary). See note 2. Enable the "Messaging Menu ...." and restart. 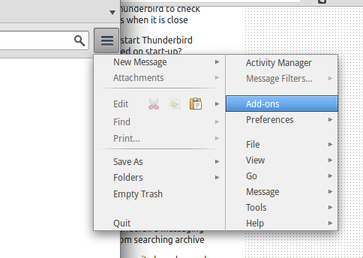 AFAIK, thunderbird does not have a background service that will fetch mails and show indicator. You have to loginto your mail to get notifications. I found my answer, all I had to to was install a package called thunderbird-gnome-support that somehow was not installed by default. For me the package 'thunderbird-gnome-support' doesn't work and i doesn't know what this is actually doing. It will send a message to 'notify-send' library. Not the answer you're looking for? Browse other questions tagged release-freya wingpanel notifications thunderbird or ask your own question.